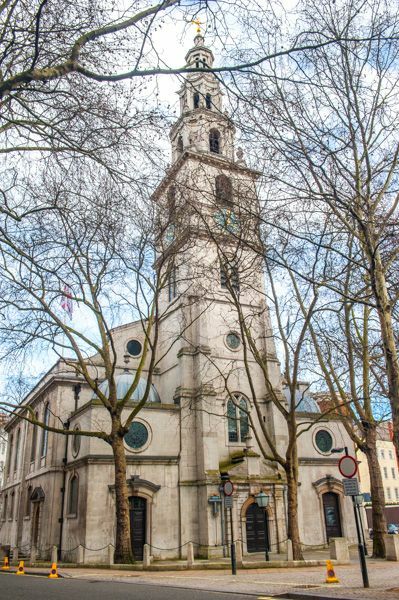 St Clement Dane's is a late 17th-century 'Wren church' on a traffic island in the centre of The Strand. It is the official church of the Royal Air Force contains over 8oo badges of RAF squadrons and units. The first church here is thought to have been built by Danes in the 9th century, giving rise to the second part of the church's name. The exact origins are unclear, with several versions of the foundation differing in details. 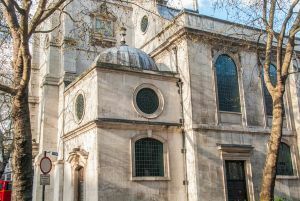 One version is that the Danes settled in the village of Aldwych, outside the city walls of London, and built a church dedicated to St Clement, patron saint of mariners. An alternative version of the tale suggests that when Alfred the Great defeated the Danes, evicted them from London, and forced them to accept Christianity, he ordered the church to be built. Another possibility is that the church was built as a memorial to Danes massacred on the spot. Yet another tale says that when the Danish Earl of Huntingdon, Tosti, was killed in battle by Siward of Northumbria, he and his fellow Danes were buried here and a church erected to mark the spot. And yet another theory is that the church commemorates Harold Harefoot, the Danish king who died in 1040. We are on firmer ground when it comes to the story of the church in medieval times. William the Conqueror rebuilt St Clements, and it was completely rebuilt again in the late Middle Ages. 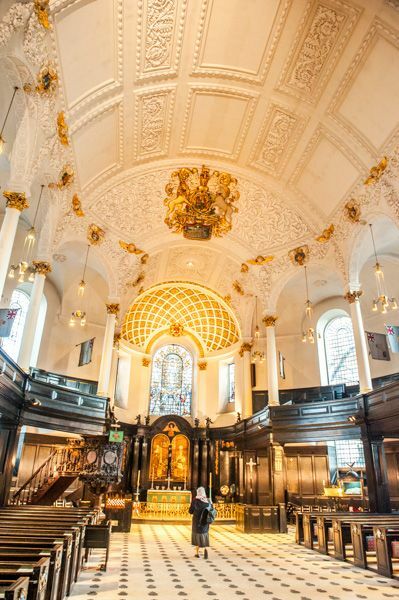 By the late 17th century it was in such a state of decay that it had to be pulled down, and a completely new church built on the spot by Sir Christopher Wren, beginning in 1680. 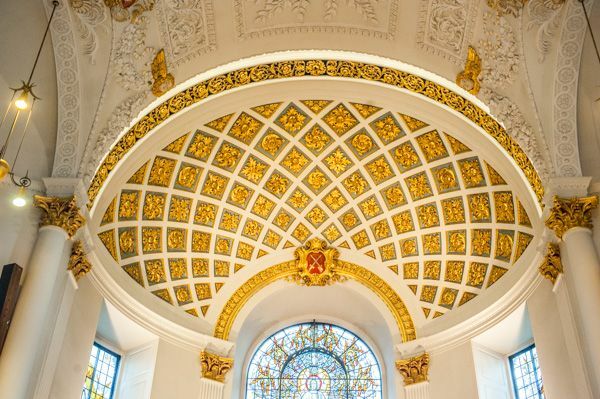 Like so many other 'Wren churches' in London, St Clement's is in an elegant neo-classical style, with a tall west tower rising in stages like the top of a wedding cake. 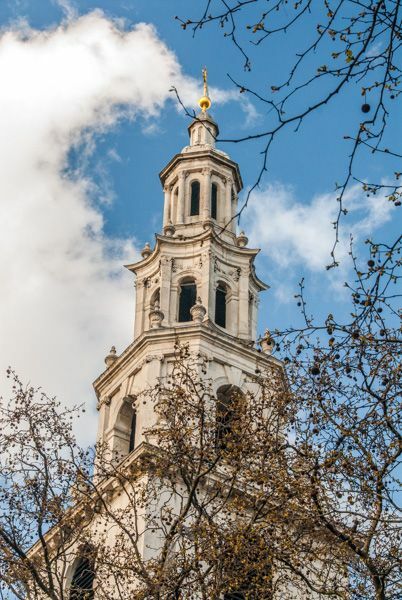 Though the tower is Wren's the steeple on its top was added by Wren's pupil, James Gibbs, in 1719. 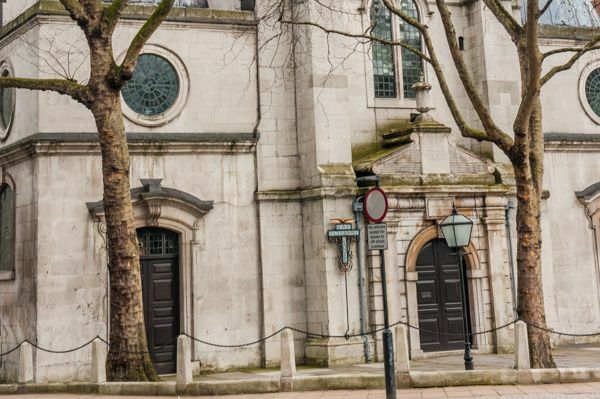 Like so many London churches, St Clement's suffered in the Blitz. On 10 May 1941 it was badly damaged by German bombs, and though the exterior survived relatively intact, the interior was completely gutted and had to be rebuilt. Money for the reconstruction came from public subscription after an appeal was launched by the RAF. The church reopened in 1958 and has served ever since as the Central Church of the Royal Air Force. 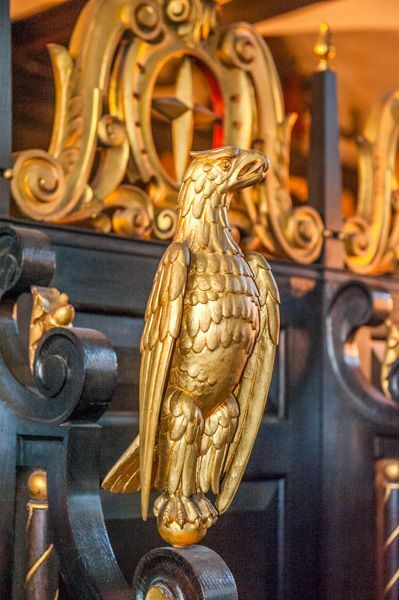 The interior is filled with memorials not only to RAF airmen and regiments, but to other aviation regiments as well, including a memorial to Polish airmen who fought in Britain in WWII, and a Book of Remembrance to both RAF and American airmen based in the UK. The association with the RAF is strengthened by the presence of two statues outside the church to WWII RAF leaders Hugh Dowding and Arthur 'Bomber' Harris. The Harris statue was very controversial, due to his role in the bombing of Dresden. The unveiling of the statue in 1992 was met with protests, and for a time the statue had to be guarded around the clock to prevent vandalism. Much less controversial is a statue of Samuel Johnson of dictionary fame, at the opposite end of the traffic island that acts as the churchyard. The bells of St Clements were made famous in the nursery rhyme "Oranges and Lemons". Or were they? 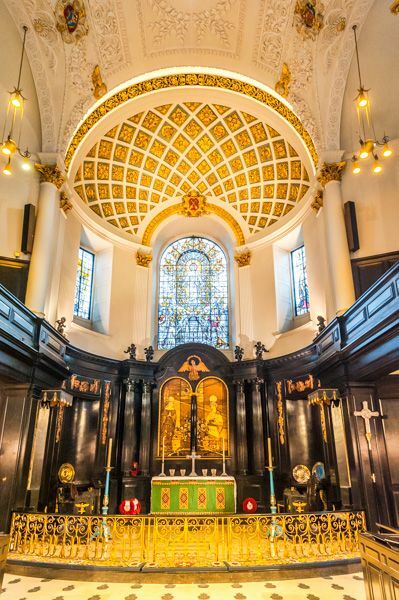 Though St Clement Danes has long claimed to be the church referred to in the rhyme, the church of St Clement Eastcheap, within the square mile of the City, also makes the same claim. That doesn't stop St Clement Danes from holding an annual service to honour St Clement, and after the service oranges and lemons are given out to children. 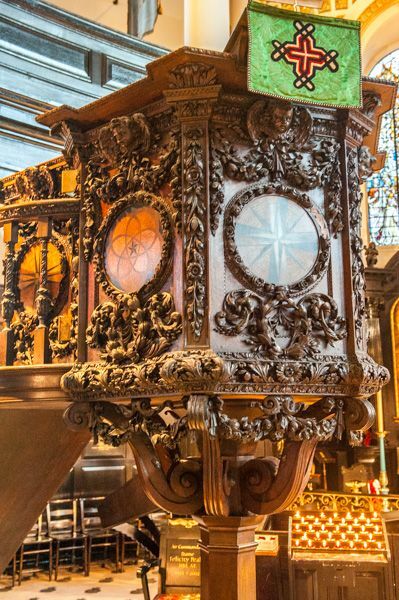 Our current information is that the church is open daily from 9-4pm, though we did once find the doors locked during that time, but the next time we tried, the church was open. It is probably a good idea to check the official website before making plans to visit. Location: On a traffic island in The Strand, a few minutes walk from Trafalgar Square. Usually open daylight hours.